Experience the relaxing, fun, and exploratory sport of whitewater kayaking in ideal setting: professional instructors and warm water! The river is also located only 2 hours east of Medellin! This 2 days Introductory Kayak Course brings people of all backgrounds to whitewater kayaking in an enjoyable and safe learning environment. In addition to navigating rivers, you have the chance to discover rural lifestyles and pristine jungles. Stay overnight in a Finca with a private pool! At the end of the trip, our goal is for you to be able to paddle safely class 2 on your own! Demonstrate your learning kayaking a Class 1 and 2 rivers. Full day river trip on the Santo Domingo river – The classic section! After breakfast at your hotel, meet your guide at our adventure cafe Cra. 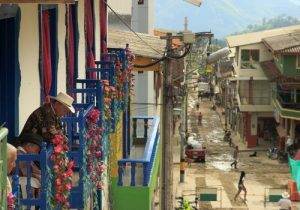 43e #11-13, Medellín, Antioquia, Colombia at 8 a.m. Start your day with an introduction to all the gear. Select the appropriate sizes of equipment and outfit your kayak. First, practice your paddle stroke on a calm sect and learn some new paddle strokes and boat steering techniques. Paddle to a small island for a delicious lunch. Enjoy the afternoon progressively kayaking onmore complex rapids, under the close supervision of your instructor. At the end of the day, relax in our Finca with a stunning view and a pool! After fresh food and fruit for breakfast at the reserve, head to the river for your first kayak full day run on whitewater! Learn how to read the currents and anticipate how they will impact your kayak. In a calm pool in the river, learn how to do a roll and many other river rescue techniques. Your guide will be close by you to help you at any time as you are learning how to safely leave your boat in the event that you flip in the river. Learn about the different type of hydraulics and the potential hazards of a river, so you learn how to identify similar features in other rivers and skillfully and safely navigate rivers. Have a snack by the river and enjoy the day paddling the river with your guide at your own pace to truly learn how to improve your kayak skills and increase your confidence on the river. After a 2 hours drive, arrive to Cra. 43e #11-13, Medellín, Antioquia, Colombia by 7 p.m. * arrival time may vary. Extend your trip by 1 day and 1 night to continue to kayak down other sections of the Rio Guatapé. Change area by driving for 2 hours and spend a restful night at Reserva Zafra Touristica. You may be ready to head to the river with confidence to paddle a whole section of river! We will drive to the upper Rio Guatapé put in, an 8 km stretch of class 2/3 whitewater. Get ready for a full day of adventure in a beautiful natural setting with water that is crystal clear and rapids that form from white round granite boulders. This is when you will realize the magic of kayaking as a means for exploration to pristine environments. Enjoy lunch on the river. Towards the end of the river, there are two small drops, which gives you the occasion to try your first waterfall! Return to Reserva Zafra Turística for a shower and a snack before driving back to Medellin. After a 2 ½ hour drive, arrive to Cra. 43e #11-13, Medellín, Antioquia, Colombia by 7 p.m. * arrival time may vary. Accommodation at our Finca with private pool! At the permaculture in San Rafael, experience comfortable lodging in pristine environments with onsite restaurant. 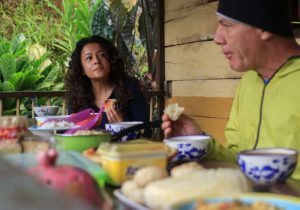 On day trips enjoy lunches and snacks prepared by a French chef or local, Colombian cooks. Kayak and gear is included and kayak school is open all year.